The future of one of Scotland’s brightest swimming stars certainly looks in the pink thanks to sponsorship from one of Scotland’s biggest salmon producing firms. Rachael O’Donnell, winner of Scottish Swimming’s Citrus Trophy for the Best Junior Swim at the National Short Course Championships in 2012, has been granted additional funding by Meridian Salmon Group to support her bid for success in up and coming competitions. The firm will now fund Rachael with £200 per month for a year, which will cover travel, accommodation and swimsuit costs as she moves to compete as a senior swimmer in top level competitions such as the Scottish Open Championships and the Scottish Tri Nations Meet. Rachael, from Dunfermline, said: “It really makes such a difference to have this support from the Meridian Salmon Group. It’s a good feeling knowing that the company are interested and want to help. “Their support takes some of the financial pressures away from me and my family and I can focus more on the improvements I need to make to step up a level. Rachael started swimming at the age of nine with lessons in the local Dunfermline pool. She started competing at the age of 10, with Inverkeithing Competitive Amateur Swimmers but moved to the performance squad at Carnegie Swim Club when she was 13. 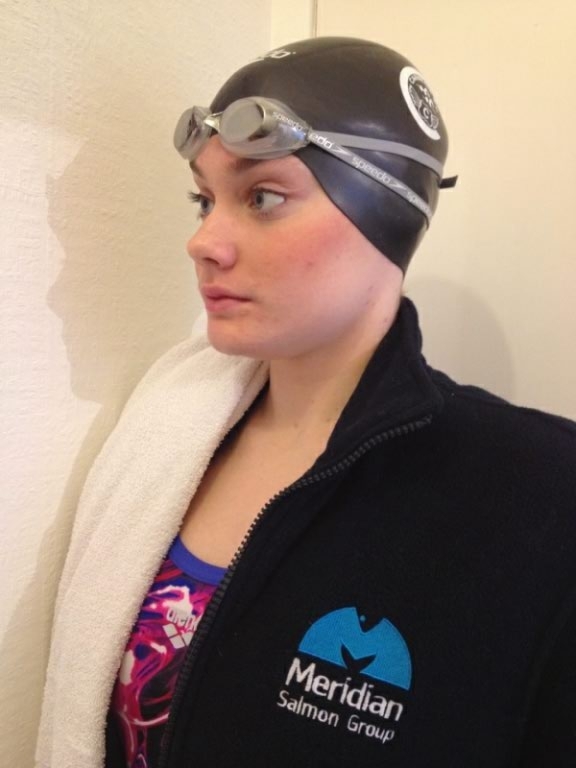 Now 16, she has already enjoyed a very successful swimming career, winning five National Junior Titles at The (short course) Scottish Gas Scottish National Open Championship at the Royal Commonwealth Pool in Edinburgh in December 2012. At this event Rachael also took the overall Bronze Medal in the 200m freestyle and 100m Fly, events in which she competed against senior swimmers. This success followed on from five Junior Titles won in the National Long Course Championships in the summer. In order to stay competition fit, Rachael trains six days out of seven, swimming for around 18 hours a week. Funding from Meridian Salmon Group will help support this. Willie Young, Business Support and Processing Director at Meridian Salmon Group, said: “We are committed to helping the local communities in which we operate providing support when and where we can, which is why we are delighted that we have been able to support Rachael in her swimming career.